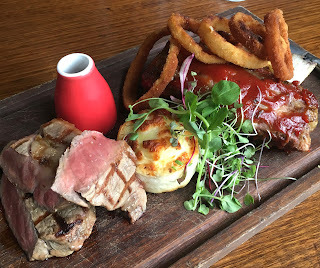 This delicious meal combines four dad-friendly favourites: Potato Gratin, Beef Rib, Bourbon Glaze and Crumbed Onion Rings. This meal will make for one happy dad this Father's Day! Arrange some of the potato over the base of the tray and top with a little onion. Sprinkle with a few slices of garlic and season with salt and cracked black pepper. Continue layering with the remaining potato and onion, adding garlic every second or third layer. Bake for 45 minutes or until potato is cooked through and top is golden. Let the tray of gratin go cold and set. Get a pan nice and hot and seal the ribs until they have a nice caramel brown colour. Add ribs to a big roasting dish and fill with some diced onion, Garlic, rosemary, thyme and veal/beef stock. Cover the tray with baking paper and then with tin foil, place in the oven on 84 Degrees Celsius and slow cook for 14hrs. Once the ribs are cooked remove from the tray and strain the stock into a smaller saucepan. This can be kept to be used for another time when slow cooking or reduced into a delicious Jus. Place the ribs in another tray, pour some of the bourbon glaze over and put them in the oven for 10 minutes at 180 Degrees Celsius. When ready, plate the ribs add a little more bourbon glaze and top with onion rings. Combine all ingredients together to produce 600ml of bourbon glaze. Slice onions into 1cm thick rings. Dust the rings in flour. Then add to egg wash.
Once completely coated in the egg wash, add to the bread crumb. Add the rings back to the egg wash, then to the bread crumb to get a nice even thick layer. Once ready fry until golden brown and serve. Thank you to our friends at Meat Market on Melbourne's South Wharf Promenade for sharing this delicious recipe. Dedicated to the flavours of an open flame grill, Meat Market is the ideal spot to sample the best meats Victoria has to offer. On Father’s Day, Meat Market is offering dads and their families some R&R with ‘Ribs and Rump’ platters available for $49 per person. For bookings call 03 9008 8953. www.meatmarketsouthwharf.com.au.